In typical RoodonFood fashion I had an expiring Groupon and waited until the next to last day to redeem it. I’m so glad it didn’t go to waste. Mozzarrelli’s Gluten Free Pizza is fantastic. Located at 38 E 23rd (between Madison and Park), the restaurant is exceedingly clean otherwise it looks like any other pizza place. The deal included pasta, a 12 inch pizza and a gluten free dessert. 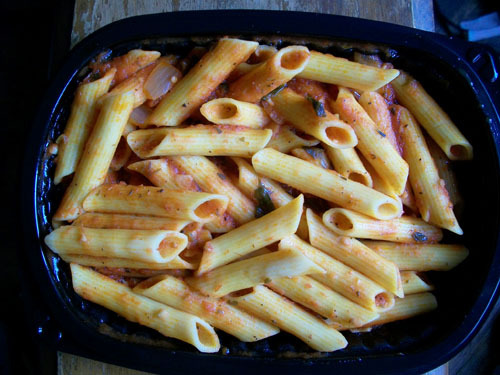 The pasta was a delicious penne (corn based) in tomato sauce. To be honest you’d have no idea it was gluten free. The tomato sauce was a little sweet which usually indicates San Marzano tomatoes or just a little sugar added to the sauce. We loved the pizza as well. The crust was fluffy, with a hearty nuttiness and totally different than any other pizza I’ve had. Made of a brown rice and bean mixture the crust had a pleasing sweet aftertaste as well. 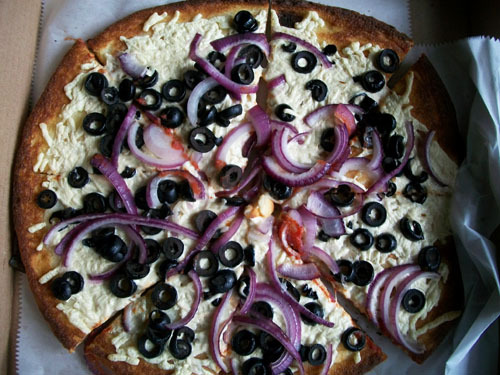 It contrasted perfectly with the saltiness from the daiya (vegan cheese), onions and black olives. The bonus is that those that are gluten free can buy individual slices in-store. You also buy the gluten free crusts ready-made and cookies online. 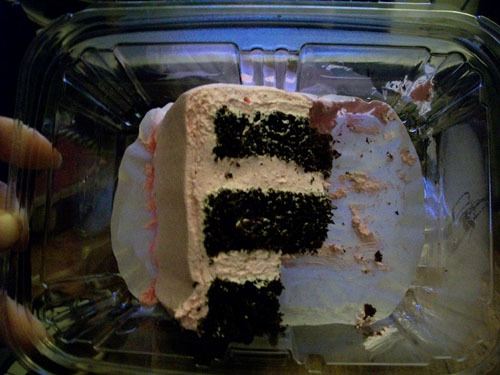 The dessert was a slice of chocolate cake with a raspberry/strawberry cream. I apologize for the picture. I stepped away for a minute and someone ate half of it. The cake was very moist. Accompanied by the frosting, which was very light, this cake didn’t taste as heavy as expected. Without the special the GF pies start at $24 so they are a treat but Mozzarelli’s did not disappoint. The next time I’m in Gramercy I’ll grab a regular slice and my girlfriend can grab a gluten free. Mysteriously missing half the slice. ← Double Yolk Eggs: Work of the Devil or Great Value?